Pearl-embossed dots look like satin-covered buttons, lending a tailored feeling to this long, crisp invitation card. Wide, beveled borders of pearl embossing finish the edges of this fine paper. I have ordered several products from Invitations by Dawn. Not only was the product gorgeous but the customer service is awesome. I was nervous doing all my invitations online but they made the process easy. I was able to get some custom features too - all at better prices than other sites/sources. I highly recommend Invitations by Dawn. I got so many compliments on this invitation!!!! Also all my orders were always shipped promptly. Beautiful and better than I expected! I picked these out online and thought they were beautiful. I was taking a gamble purchasing them without ordering a sample first but the sale was too good to pass up. The turn around time was so fast! I have to admit I was nervous opening the box but I was SO pleasantly surprised! They were very well packaged and arrived in perfect condition despite the snow outside. The best part of these invitations was that they are raise printed. I expected the print to be flat which I had settled for because I knew embossing or raised would be out of my budget. I was SO thrilled to see that they were raised! It makes a world of a difference. 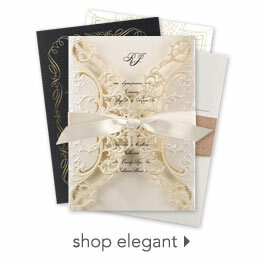 I would absolutely recommend these invitations and this site for any paper needs. I was able to customize everything on my invitation and the quality exceeded my expectations for a price that could NOT be beat! Nice enough for price but was hoping for heavier paper stock. I' m not too picky. Focused on pretty and simple and this is what I got. I had left off an important line on invitation as I rotated them up and down with arrows. I had to call back and get remade, but service woman was very helpful. She also helped me get the correct size napkins re-made. These invitations are perfect for our wedding! We wanted something classic but not boring, we got exactly what we were looking for. Simple yet eloquent!! Love them!! Great product. Fast delivery! Definitely would recommend and buy again! I really liked that the photo matched the actual card perfectly. I had experiences with other websites that when I ordered a sample the card did not match the picture that I saw online and that was a huge disappointment. I especially loved the price of the nvitations. The only thing that I would change is the extra back on the RSVP cards. I actually cut that part off from mine with a paper cutter. The delivery was perfect! Everything was packaged really nicely. I wish that the boxes were labeled on the outside it would had helped a lot with assembling the invitations. Really pretty and classy invitations. Well done. They sent me my invitations in the wrong color, so I called customer service. The lady I spoke to was so helpful. She sent me new invitations quickly and at no charge and even let me make a change to the wording at no extra cost. The new invitations just came in the mail and I LOVE them! I would recommend Invitations by Dawn to anyone. Great experience. There was actually a messed up invite and a few blank ones but they put extras in, I'm assuming in cases where this may happen, so we actually got a few extra! I was very pleased with how elegant and professional they were. I was kinda worried about not seeing them beforehand and just placing an order online but it couldn't have worked out better. These invitations turned out better than expected. I received a lot of compliments from my guests. Everyone thought they were very classy and elegantly done. I would recommend them to everyone. Awesome wedding invitations. Turned out perfect and just what I imagined. Great customer service and fast processing. They want customer satisfaction and really do care. These invitations are simply stunning! The paper is good quality and the ink is crisp! I purchased wedding invitations. I liked how fast they came and that I was able to get free samples. I was upset because several of my invitations came with an ink snag on my fiance's name. Also, the envelopes that came with the invitations were hard to seal. Fantastic, we were extremely pleased!!!! Fantastic product. The paper quality is perfect and there was alot of fonts to coose from. The customer service team was outstanding and the address personalization option was fantastic. We are all extremely pleased wit the outcome. Received the invitations in about 10 days after ordering and most of that time was shipping time. It came exactly as I had typed it out and looked exactly like the sample I requested. The only thing different about it was the ink color: I requested hunter green ink. What I got was precisely what I wanted but it was different from what was shown on my computer screen when I ordered it. I expected this and am incredibly pleased with the ink color as it turned out. Loved the whole process and the invitation I ended up with!